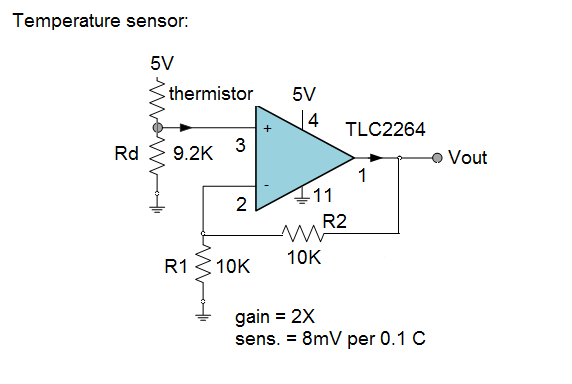 This is a brief note about the design and construction of a temperature sensor using a thermistor, and operational amplifier, and the PIC16F777 microprocessor as a data logging module. We used the above circuit. 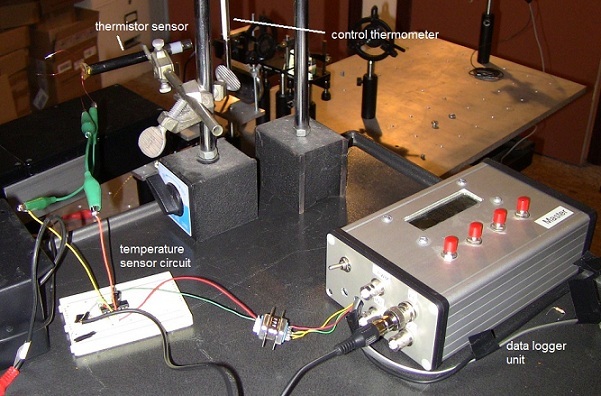 The thermistor was one selected from my junk-box which had a room temperature resistance of around 10K. To simplify matters, we chose a rail to rail single supply OP-amp in the non-inverting configuration that would work off the 5V supply of our PIC processor circuit. The voltage divider that the thermistor forms a part of, generates a temperature dependent varying voltage at the non-inverting input in the 2 – 2.5V range, this ultimate value dependent on the choice of the resistor Rd in the divider – I selected 9.2K since this would end up giving me around 4.5 volts at the output of the op-amp for a narrow range near room temperature. Since the amp has a gain of 1+ R2/R1, with the values chosen we have a total gain of 2, which gives a resolution of around 8mV per 0.1 deg. C. This works well in the 15 – 25 deg. C range – for a broader range Rd would need to be adjusted to a different value. Shown below is the microcontroller interface. The Vout of the temperature sensor goes into AN0 (pin 2) of the PIC16F777, which is the first A/D input line. The voltage is sampled once each second, and every minute the 60 readings are averaged and sent to a host computer via a serial output on pin RB1. The data is sent in ASCII format including a time stamp and the measured temperature value. Only two wires are necessary, TX and GND. Which connect to an RS232 to USB converter which can then be conveniently connected to a computer USB input. The data baud rate is set to 9600 baud, 8,N,1. The PIC is programmed with a software routine using MPASM assembly code which is too long to describe in detail here. Briefly, it includes a time of day clock and a routine to sample the data and convert the values, as well as a control routine for an LCD display that is menu driven using 4 push buttons. Part 3: Collecting the data directly into Excel. Since it is highly convenient to have the data collected put into an Excel spreadsheet format for analysis and presentation, we sought to design our data logger so that it would send the serial USB data directly into a spreadsheet in real time. This was accomplished using a program freely available on the internet called PLX-DAQ. 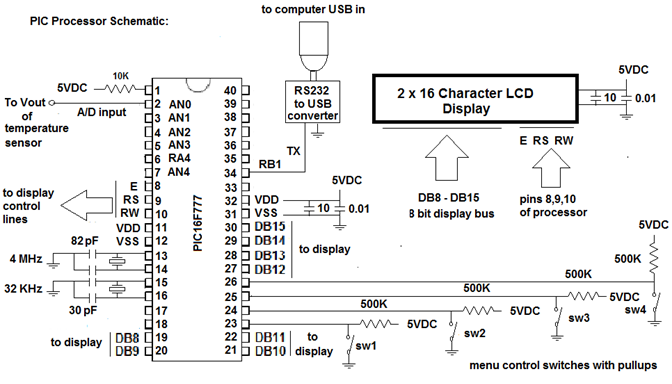 This program is designed to accept ASCII data sent through a serial USB connection as long as the data train conforms to their prescribed format. Fig. 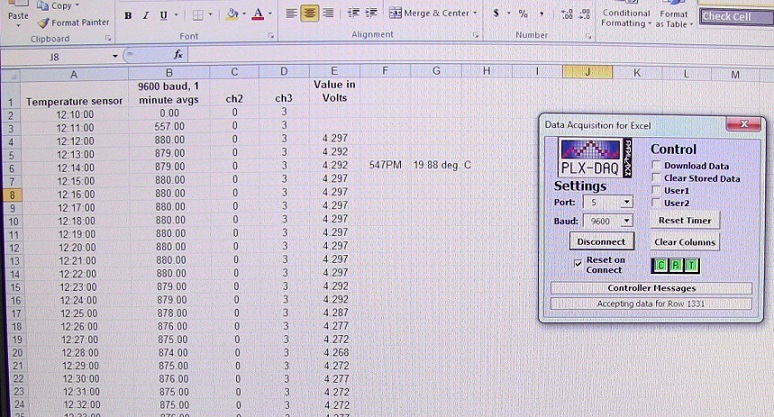 4: Screenshot of real time data being received serially into Excel using PLX-DAQ. Part 4: The end result – real time temperature data! As can be seen above is an example of data collected every minute using the data logger over a period of 24 hours. The logger collected 86400 values which were averaged to 1440 minute values delivered in real time. 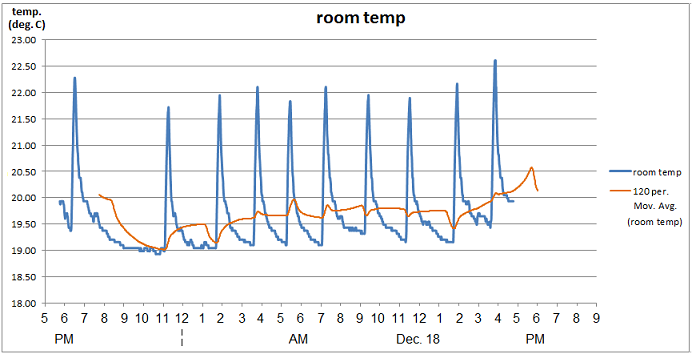 The data was taken in early winter, so the temperature spikes are due to the heating cycles of a forced air gas furnace heating the room periodically. Outside temperature was around 9 deg. C during the day on Dec. 18th.